On Wednesday, March 28th, Junior Achievement of Central Maryland hosted its annual Leading Ladies event. 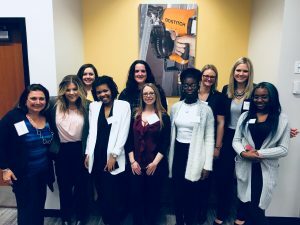 Local high schoolers and businesswomen gathered at Stanley Black & Decker in Towson, Maryland for a morning filled with speakers, mentoring activities, and a surprise appearance from the Cardinal Shehan School Choir. Offit Kurman attorneys Angela Pallozzi and April Rancier sponsored and attended the event. Junior Achievement’s Purpose is to inspire and prepare young people to succeed in a global economy. Junior Achievement has 109 local JA Areas across the nation, and together we are the nation’s largest organization dedicated to giving young people the knowledge and skills they need to own their economic success, plan for their futures, and make smart academic and economic choices. JA’s programs—in the core content areas of work readiness, entrepreneurship and financial literacy—ignite the spark in young people to experience and realize the opportunities and realities of work and life in the 21st century.